Gould's Lagoon, near Granton, in southern Tasmania, has this summer become something of a Mecca for many local and visiting birders. 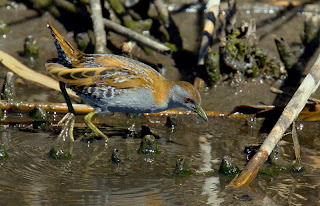 The centre of their 'excitement' has been the sighting of several crakes including at least 2 Baillon's Crakes, something of a rarity in this state. Their job has been made decidedly easier by the low water levels and a relative paucity of reed cover. Crakes are 'lurkers' by nature, preferring the dense reedbeds to the exposed mud, but have been forced into the open as the food rich wet mud has 'receded' from the reedbeds. On hearing of first one, then 2, Baillon's Crakes, I just had to visit "Gould's". 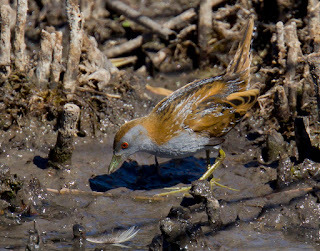 A single bird was first reported by Ed Pierce in early December and tentatively IDed as a Baillon's Crake. Rodger Willows subsequently sighted this bird and then a second, keeping birders updated as to where they might be seen. I made several brief visits, but 'only' sighted several Australian Crakes, but there were many other "goodies" sighted too, including Hardheads, Grey Teal, Australasian Shoveler, Black-fronted Plovers, Caspian Tern, and Little Grassbirds to name a few. After meeting Rodger Willows by chance and getting some first hand information, I eventually managed to find a single bird on the edge of the eastern lagoon. 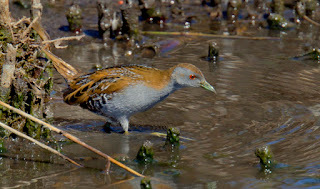 My views highlighted the difficulties of crake watching. Although I had scanned this area before, I eventually noticed a movement beneath the fallen sedge stalks, on the far side of the lagoon, some 20 metres away, and there, shuffling along, was a small bird and by its' shape, obviously a crake. I watched for sometime and eventually it broke cover and I was better able to see the colouration and confirm that it was indeed a Baillon's, my first for several years. It seemed 'nervous' and several times ran for cover, once for a passing Swamp Harrier, and again after a brief 'confrontation' with an Australian Crake. It was this event that made me aware of just how small this bird is. The Australian Crake is perhaps the size of a slightly corpulent starling, and the Baillon's, a whole size smaller, being about sparrow size, no wonder I had so much difficulty finding it. Mid January, Jeremy O'Wheel photographed the Baillon's from the hide and it appeared this was worthy of follow up and attempt at photographing said bird. So a few days later I sat in the hide and waited, not with any great conviction, but my patience was to be rewarded. Watching several feeding coot some distance away, I became aware of a small bird feeding amongst them--"the" crake--I had at least seen this 'second' Baillon's. I was joined by Els Wakefield and Karen ? and we sat patiently hoping and reminiscing about past bird encounters, all 'armed' with cameras. We took oh so many shots as it eventually 'fronted' the hide, but in the overcast, I can't say that my results, at least, were much more than record shots. So a few days later, in better light, I tried again. The second try was not without its' frustrations. First a passing Swamp Harrier scattered "everything" and no sooner had they settled down than a visiting birder arrived, having a similar effect. This was followed by 2 locals, dressed for the beach, who had little or no interest in birds or the lagoon, who stood in the middle of the walkway to take the 'obligatory' camera phone shot of themselves, before, mercifully, moving on. I mention all this, because, as you might gather, I did become somewhat frustrated by this toing and froing, but this is a public hide in a public place and like it or not, visitors go with the territory. I still managed the accompanying images (not to mention many others), not quite what I had hoped for, but it's not often that I get to photograph such an elusive bird. Thank you Jeremy, but you were the catalyst by indicating the photographic possibilities, as I mentioned in the blog. Their size and quick movement make for a challenge. At one point I did consider getting "down and dirty" to get a lower angle, but the intrusion would have been too great on all the birds present there. Not to mention that the last time I tried that, I just couldn't get the smell out of my clothing! It's in a more natural habitat than that first one I ever saw, which you showed me on the HEC building window ledge back in about 1981. Your pictures are great. I love the intent look on the face in the first picture. I really like these crakes. We have at least one at my local wetland in Canberra and I saw it climb a long way out on a reed this week.